OT Month has arrived and so many exciting events are happening! Not in New Orleans? Not a problem! They are live streaming seven #AOTA19 general sessions including the Welcome Ceremony, which starts today at 4 CT.
It’s Autism Awareness month as well! Autism Speaks is inviting friends and neighbors around the world to come together to pledge to go blue to increase global understanding and acceptance of people with autism. ERI is celebrating our Faculty of OTs. Register for one of these two courses and receive a $25 discount. Not to be used in combination with other discounts or course credits. 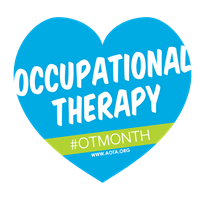 We appreciate all of our OTs and all of the hard work you do! Keep inspiring each patient every day and living life to the fullest! This entry was posted in News and tagged CEU's for Occupational Therapists, OT blog, OT CEU, OTs. Bookmark the permalink.